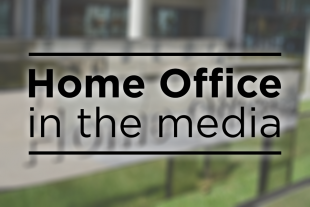 Today's Home Office stories include criticism of a deportation flight, an announcement on new police powers to tackle illegal traveller encampments, and Baroness Lawrence's comments on knife crime prevention orders at the Home Affairs Select Committee. There is significant press coverage of the Home Secretary’s appearance in the Commons yesterday where he answered an Urgent Question on a deportation flight to Jamaica. The Guardian claims that lawyers are making last-ditch attempts to prevent individuals being deported on the flight – the first it states since Windrush. The paper claims that two men – Lascelles White and Christopher Richards – escaped deportation after 11th hour interventions by their lawyers. Wider coverage in the Times and the Independent focuses on the MP David Lammy’s comments in the House where he accused the Government of “pandering to far-right racism” and claimed that its incompetence had “killed” at least 11 people who had been wrongly deported to the Caribbean. Mr Lammy went on to question how the Home Secretary knew he was not making the “same mistakes” as those which led to the Windrush scandal. The Home Secretary responded by saying that everyone being deported had been convicted of a serious crime and none was a British citizen or a member of the Windrush generation, the Times reports. The Home Secretary’s comments in the House and Home Office statements is carried in the coverage. It is only right that we seek to deport foreign nationals who abuse our hospitality by committing crimes in the UK. This ensures we keep the public safe. All individuals on this charter flight are serious criminals. The Times, Telegraph and Mail report that the Home Secretary will announce today that police will be given new powers to evict people from illegal traveller sites on private land. The papers report that the Home Secretary wants to make it easier for police to convict travellers, including dealing with unauthorised camps trespassing on private land. They report that illegal traveller encampments are currently a civil issue, rather than a criminal one, requiring landowners to spend thousands of pounds seeking a court injunction if they want to remove travellers. The Home Secretary also said he is considering making it a criminal offence for travellers to trespass on private land when setting up an encampment. The decision is said to be a significant lowering of the legal threshold for criminal action against illegally camped travellers, and give greater protection to residents whose lives are “blighted by anti-social behaviour”, including fly-tipping, abusive conduct, criminal damage, and noise, the paper says. The Telegraph says that the move follows calls from more than sixty Conservative MPs for “acts of deliberate trespass to be made a criminal offence” in the same way squatting in residential buildings was criminalised in residential buildings in 2012. The vast majority of Travellers are law-abiding citizens - but Illegal sites often give an unfair, negative image of their community and cause distress and misery to those who live nearby. There is a widespread perception that the law does not apply to Travellers and that is deeply troubling. The result of our initial consultation was clear - people want to see greater protection for local communities and for the police to be given greater power to crack down on trespassers. There is widespread coverage of Baroness Lawrence of Clarendon’s appearance at the Home Affairs Select Committee. Baroness Lawrence, mother of murdered teenager Stephen Lawrence, gave evidence at the HASC yesterday on the Macpherson report. The Times reports that during her appearance, Baroness Lawrence criticised the government’s plans to create knife crime prevention orders, warning that they would criminalise children. The paper says that believed the plans would criminalise children from the age of 12, and suggested instead that the government start educating children in schools about what would happen if they carry knives, including sending young offenders into schools to explain the consequences. The Times says that more than 30 organisations working with children have said in a letter today that there was no evidence that knife crime orders would tackle the root causes of why young people carry knives. The article carries a quote from the Association of Youth Offending Team Managers, who said that the orders were “likely to fast-track children into custody”. Knife Crime Prevention Orders will prevent vulnerable young people from routinely carrying a knife and getting involved in knife crime. The aim of the Orders is preventative, and being on an Order will not result in a criminal record. Preventing young people’s involvement with serious violence is a core part of the Serious Violence Strategy, which addresses the root causes of violence by working with a range of agencies to focus on early intervention alongside strong law enforcement. We are also providing nearly £18million over the next two years through the Early Intervention Youth Fund to help Police and Crime Commissioners and Community Safety Partnerships to provide early intervention and prevention with children and young people.